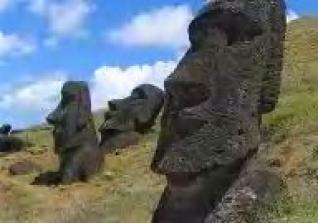 Recently, DNA evidence proved that Easter Island's inhabitants were Polynesian settlers. Easter Island is a small, volcanic island located between Chile and Tahiti, surrounded by clear water and volcanic rock. Easter Island itself is a mass of volcanic ash and rock, dotted with a sparse coastline and dry plains scattering the landscape. Easter Island's iconic Moui statues guard the edges of this island. Although most are broken or worn, they still stand stoic, centuries after its erection. Easter Island's population has been extinct for centuries, so outsiders have little clues about these origins and their purpose. Some believe it exists for supernatural, mystical reasons, and they're right. Recently, DNA evidence proved that Easter Island\'s inhabitants were Polynesian settlers. Researchers believe they came from the neighboring island of Marquesas. Around 320 A.D., Polynesians settled this isolated island, only 100 people in existence. At its height, it grew up to 11,000 people. It was during their height that they constructed Moui statues. Stoic in breadth, these stone-faced creatures dotted the shores of Easter Island, with dark, elongated faces and pronounced noses. Construction of these statues stopped in the late 1600s. Famine spread across Easter Island, and without food, people resorted to cannibalism. The population eventually died out in the 1800s. With the extinction of these people comes the extinction of why these statues existed. Why do these statues exist? There are many theories on why the Moui statues existed. The most common belief is for religious purposes. Dutch commander Jacob Roggeveen (who visited Easter Island in the 1700s) noted the discovery of 'lighter-skinned' people, disputing the Polynesian theory, that worshiped these giant statues. Covered in tattoos and extended earlobes, they held rituals and ceremonies before these stoic statues, holding some sort of spiritual or religious significance. Other archaeologists dispute this claim, claiming Roggeveen made it up. There is evidence of lighter-skinned people living on Easter Island, however. Another common theory was to honor the chiefs and religious leaders that led the island. They believed that these statues held mana, their version of magical energy. It contained the mana of the chiefs, protecting the island from disaster. They also believed it brought good fortune and luck. Unfortunately the mana didn't protect them from killing each other. There is evidence these Moui statues served as sacrificial or spiritual sites. Ahu Akivi, one Moui site on Easter Island, is surrounded by cremation pits filled with bones and shells. At other sites, scientists discovered skeletons at the base of the statues. Also, the Moui statues are interestingly aligned with certain astronomical points in the galaxy. Did they gain mana from the astronomical alignments in the sky? Did the Moui statues have a different spiritual purpose? Scientists will never know the true purpose of these Moui statues, but just like the people of Easter Island, these statues will remain a supernatural memory in the past lives of this small, uninhabited island. Only science will uncover the many secrets of this crematory island.